After last winter's catasrophic performances in snow, BMW has launched a specialist winter tyre programme designed to help drivers get the best on-road performance from their car throughout the winter months – regardless of weather conditions. Changing tyres to suit different seasons is already part of mainstream motoring in most of Europe. Now for the first time in the UK a BMW winter wheel and tyre package will be available. Summer tyres fitted as standard equipment by all car manufacturers operate best at temperatures above 7°C. This means summer tyres fitted by BMW provide excellent levels of grip, acceleration, braking, comfort and fuel economy in normal road conditions. However, once the outside air temperature gets nearer to freezing the rubber in summer tyres hardens, which detracts from their performance. 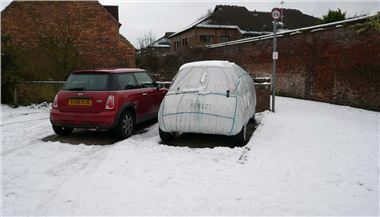 In true wintry conditions of snow and ice, as blighted all of the UK earlier this year, tyre performance is even worse. The new winter wheel and tyre packages developed by BMW have been specially engineered to operate much better than summer tyres at temperatures below 7°C. The tyre is made from a different mix of rubber / silica compound which enables them to operate efficiently at much lower temperatures, generating heat and reaching their optimum operating temperature much more easily. The benefits of such a package are two-fold. It is the best way to a BMW performing to the best of its abilities during severe weather, yet if the winter is mild, winter tyre users will still benefit from significantly reduced tyre wear and increased wet weather grip and performance. There is a potential cost benefit too. The new BMW winter wheel and tyres can result in as much as 40 per cent* better wear characteristics than summer tyres when the outside temperature is below 7°C – meaning the tyres will last a lot longer. Winter tyres also feature bigger tread blocks with larger open channels which ensure they dissipate standing water more effectively, helping them to reduce the risk of skidding on wet surfaces. This sophisticated tyre technology ensures maximum levels of grip over winter, significantly reducing the chances of an accident, whatever the conditions. Braking distances improve by up to 20 per cent on icy roads and up to 10 per cent in the wet. A number of different wheel styles and sizes, including alloy and steel rims are available. Prices vary by model but start at £600 for a complete set of four winter wheels and tyres on a BMW 1 or 3 Series. ** Interested customers should contact their local dealer for more information. Cheaper wheel and tyre packages are available from the links in the useful websites directory under parts, accessories and tyres. *Depending on driving style and annual mileage. **Complete wheel and tyre packages are delivered with the tyres already fitted and balanced, vehicle fitment charges may apply.